In the context of the relatively stable economic situation and healthy credit flow, ‘real’ residential demand is on track for sustainable growth in 2017. CBRE Vietnam’s managing director Marc Townsend explained the contributing factors to this situation. In 2016, the real estate market continued in its positive trend, following 2015’s signs of resurgence. In general, the overall market developed stably. Although the supply of apartments in 2016 was not as high as 2015, the figures increased steadily quarter by quarter. In the first nine months of 2016, Hanoi recorded a total of approximately 18,900 apartments, while Ho Chi Minh City recorded 25,800 new apartments offered for sale. These were mostly in the mid-range segment – which accounted for nearly 80 per cent of new offerings. Regarding the number of apartments sold in the first three quarters of 2016, CBRE recorded approximately 14,200 and 23,000 units sold in Hanoi and Ho Chi Minh City, respectively. In these transactions, sales caught up relatively quickly with supply. The forecast for the last quarter of 2016 is for this stable trend to continue in both supply and demand. A stable economic environment is the basic foundation for the development of the real estate market – it is necessary to create confidence for investors. The main indicators of the macro-economy, such as GDP or consumer price index, showed a relative trend of sustainable development. According to CBRE, the real estate market is developing stably and investor confidence is high. In addition, the increase in the number of newly established real estate businesses has shown the growth of the market. 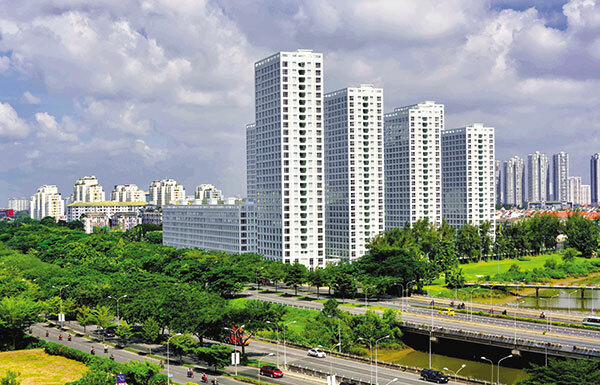 In terms of policy, Vietnam has made efforts to improve the transparency of the market, such as the laws on Housing and Real Estate Business, dated January 7, 2015, or the amendment of Circular 36 issued in 2014 in order to minimise risk. It is noteworthy that the real estate sector has exhibited better growth than many other business sectors. Moving on to this year, the government’s decree on construction, management, and the use of information systems in the housing and real estate market has also been effective from January 1, 2016. This has resulted in significant support for building information systems based on policy making and sustainable development strategy for the market, which contributes to market expansion and attracts more buyers and foreign investors. The Vietnamese real estate market has a number of strengths that make it more suited as a destination for foreign investment compared with other countries in the region. More than 60 per cent of the Vietnamese population is 35 years old or younger, providing abundant labour resources, as well as the largest source of demand for real estate. The country’s economic growth is on track to keep up its healthy rate. The investment opportunities offered compare favourably with other developed markets in the region. In addition, Vietnam is both politically and socially secure, creating a good atmosphere for economic development. Infrastructure and more favourable legal conditions for foreign property investment are piquing the interest of foreign investors. A clear proof is the outstanding growth of the total registered foreign direct investment in real estate in 2015, after the laws on Housing and Real Estate Business were enforced. In 2017, the real estate market will continue to develop in a steady and sustainable fashion. This is based on the context of a relatively stable current economic situation, and a sustainable rise of ‘real’ demand in accordance with the growth of supply. The credit flow into property is still being controlled with steady interest rate levels, regulated by the State Bank of Vietnam (SBV). SBV’s Circular 06, released in 2016, contributes to the reduction of credit risk for the real estate market. A major development for the coming year is that real estate projects will benefit from the development of a transport infrastructure. From late 2017 to the middle of 2018, elevated railways in Hanoi (Cat Linh-Hadong) and Ho Chi Minh City (Ben Thanh-Suoi Tien) are expected to go into operation, which will add significant value to projects located along the routes. In addition, the stable macro-economic environment and the increasing income per capita will continue to increase demand and create market trust. Another positive sign is that investors are more aware of market research, and the need to offer products that match the tastes of buyers and the absorptive capacity of the market.